CHULA VISTA, CA. 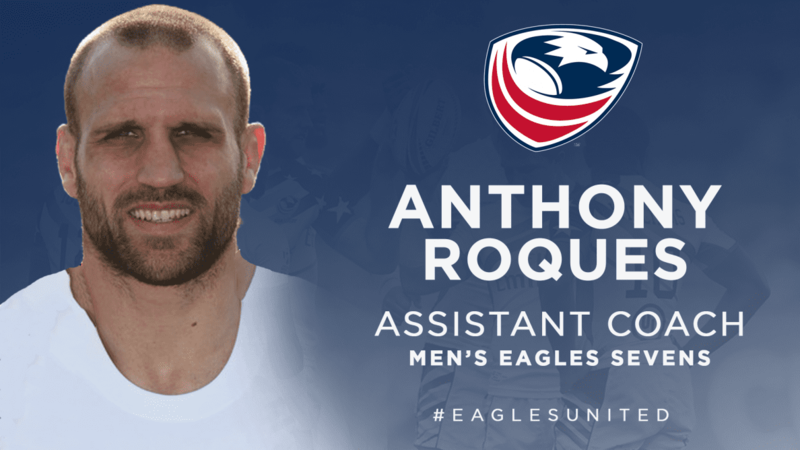 - Former RFU Coach and player Anthony Roques has been selected as the new Assistant Coach for the Men's Eagles Sevens, USA Rugby announced today. Previously an Assistant Coach for England Men's Sevens from 2014-2018, Roques has been a part of three gold medal victories in the HSBC World Rugby Sevens Series, a bronze medal at the Commonwealth Games 2018 for both the men and women's sides; as well as a silver medal at Rugby World Cup Sevens 2018. In just four years with the union, Roques helped the England men's side qualify for the Rio 2016 Olympic Games and achieve their highest World Series finish in a decade (2nd place) at the conclusion of the 2017 season. A former England player himself, the new Assistant Coach has competed in 28 World Rugby Sevens tournaments -- including 7 cup wins -- along with the Commonwealth Games 2002 and Rugby World Cup Sevens 2005. He also spent time in the Premiership with the Saracens and London Irish from 1997-2005 before retiring and moving into coaching. Joining the USA Rugby setup at the start of an Olympic qualifying year, Roques' expertise as a player and a coach will be undoubted resources to the growth of the Men's Sevens program ahead of Tokyo 2020. "I am very honored and excited to be joining such a highly regarded team within the World Series," said Roques. "This squad has a really good blend of speed and power and I hope my attributes as a coach can further support the development of this program. "Having been coached by Mike Friday and played with Phil Greening during my time with England Sevens, I am looking forward to contributing to the amazing work they've done and being a part of the Men's Sevens' journey." With former Assistant Coach Chris Brown now leading the Women's Sevens program, Head Coach Mike Friday is elated to have another proven rugby professional on board. "Rocky is a hugely-experienced and proven international coach who understands what it takes to win on the World Series circuit. He has the personality and Rugby IQ to bring new dimensions and complement the existing dynamic," said Friday. "He is already fully-embedded into the group and challenges the boys and the management in a way we need so we can continue to evolve as a collective in a hugely challenging two years." Roques' first appearance as Assistant Coach will be the Dubai Sevens 2018 where the USA men will officially begin their Olympic qualifying year. The competition takes place Nov. 30 - Dec. 1 with the United States drawn in Pool C alongside New Zealand, Spain and Wales. Broadcast information will be announced closer to date.